Later in the week, Tawn and I had a second opportunity to visit with Jason and Daniel, taking them to see a Thai market. Wet markets (in other words, those that sell meat and produce) are often one of the best ways to get a really good look at the culture of a place you are visiting. We chose the modern, clean, and convenient to get to Marketing Organization for Farmers market, known by its Thai initials “Or Tor Gor”. 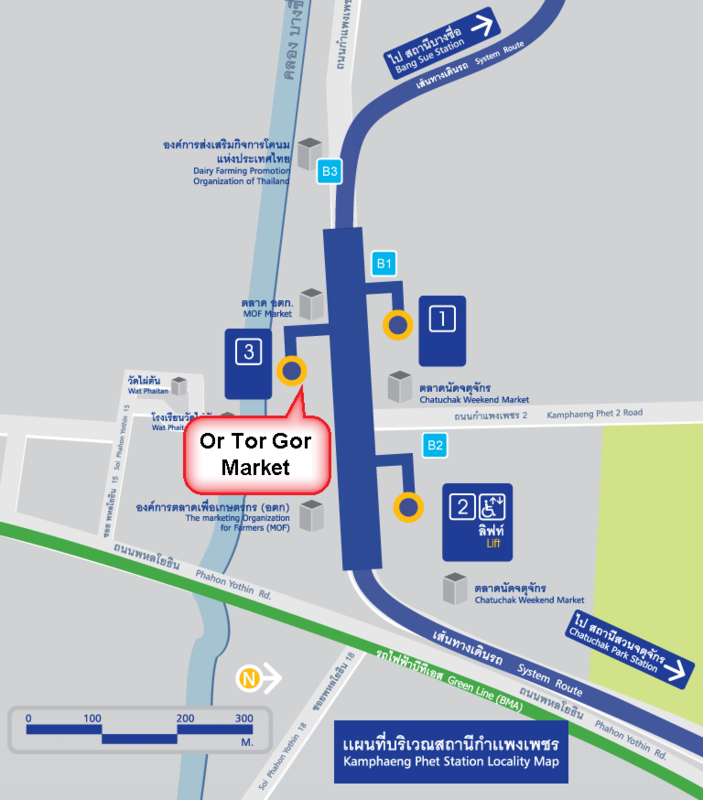 Or Tor Gor market is located across the street from the Chatuchak (“JJ”) Weekend Market, immediately outside exit 3 of the Kamphaeng Phet subway station and a short walk from the Mo Chit Skytrain station. It is open every day of the year and remains busy until the afternoon, so unlike some markets that are most active at the crack of dawn, you can catch a few winks and still see Or Tor Gor in action. There are loads of fruit and vegetable vendors, selling both locally grown and imported varieties. 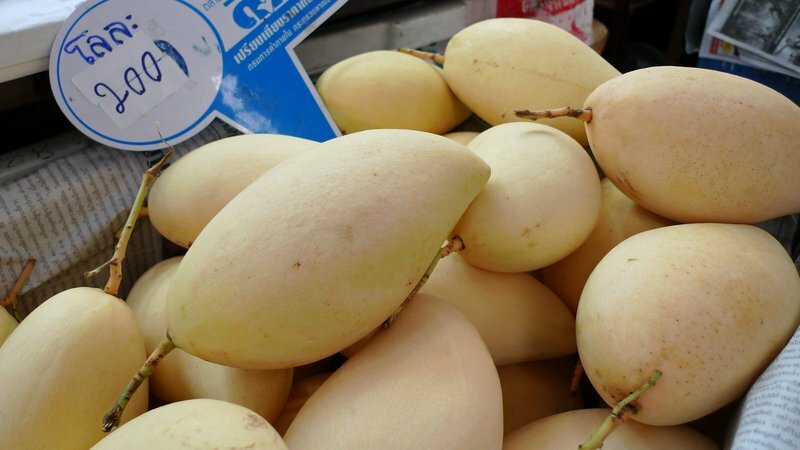 Even though it is a few months before the height of the mango season, many vendors had a large selection of fragrant “Flower Water” mangoes. Dried fruit is an excellent way to bring a taste of your trip home with you. 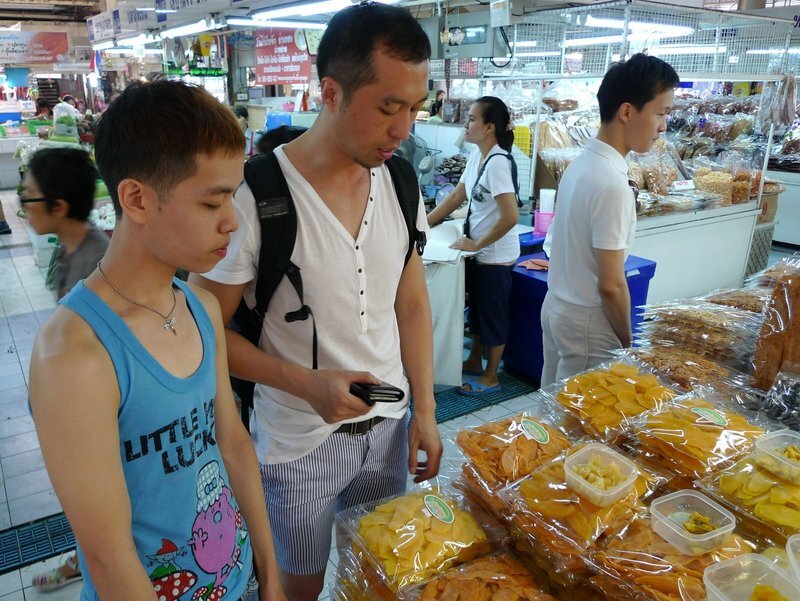 Here, Jason and Daniel consider the different offerings including mango (lighter yellow) and papaya (orange). Curries are one of the staples of Thai cuisine, but even most Thais who cook at home will rarely go to the trouble to grind their own curry paste. (Although I would like to try and make my own curry paste one of these days.) 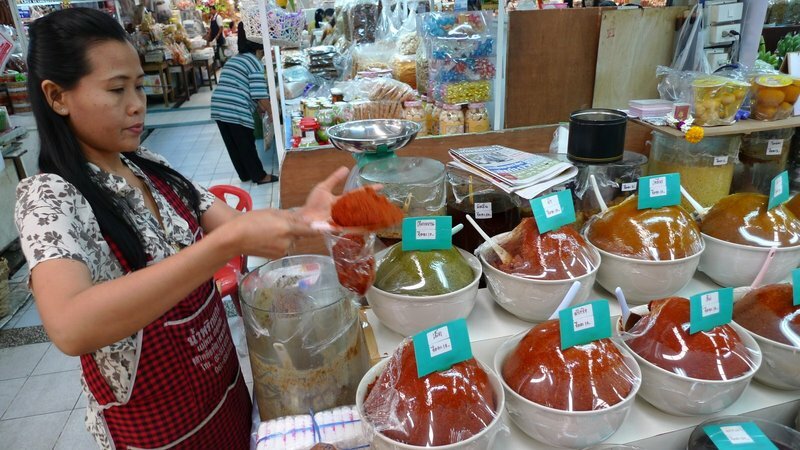 Instead, they purchase freshly made curry paste from the local market, available in many varieties. Tell the vendor what kind of curry you want to make and she’ll tell you what vegetables, herbs, and meats you need to buy and in what quantities. 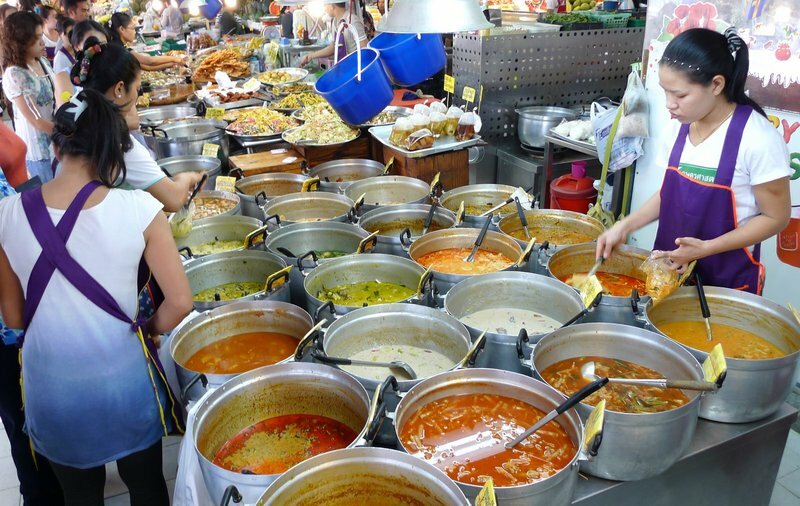 This market also has a significant cooked food section so you can buy your meal here and when you return home all you have to do is make some rice. This vendor is selling curries. By my count, approximately twenty different types of curry! Some use the same type of curry paste but are varied by protein and whether or not they use coconut milk. If you’ve ever tried a “jungle curry” at your local Thai restaurant, that is a curry made without coconut milk. Lots of snacky items available, too. 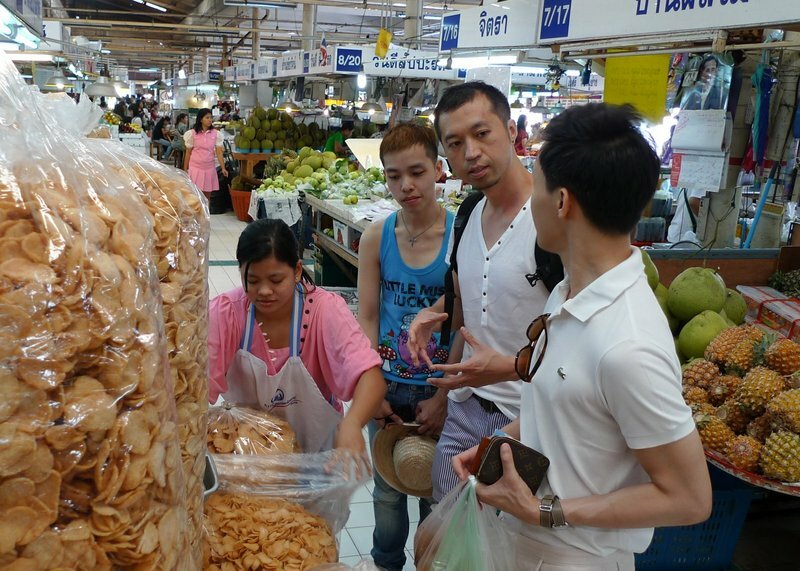 Here, Tawn and Daniel discuss the different flavors of shrimp chips available for purchase. You can buy these cooked (as you see here) or in small uncooked discs that you fry in oil at home. I can’t imagine the benefit of frying them yourself so much better to buy them precooked. 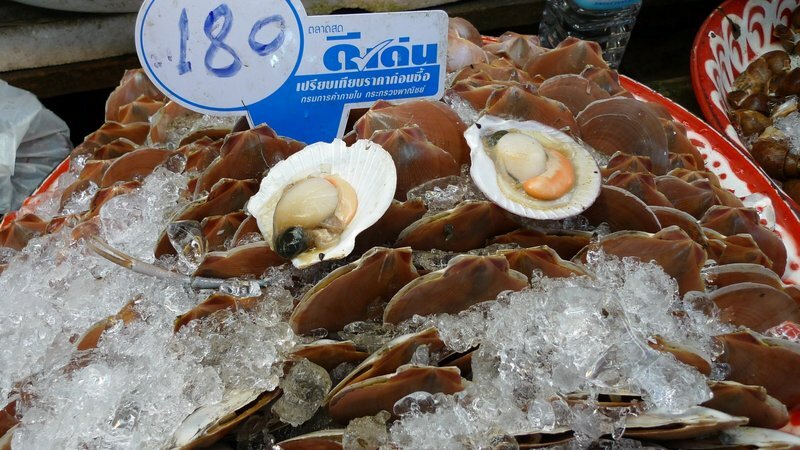 Thailand is home to inexpensive, high-quality seafood and Or Tor Gor market is a good place to buy it. 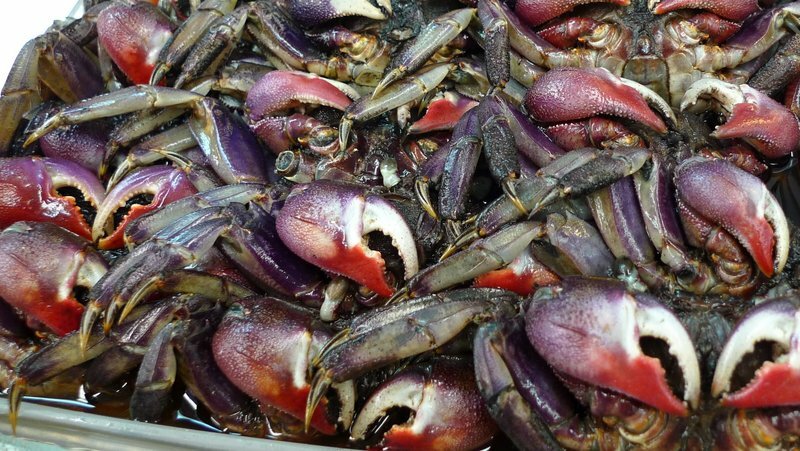 Above is a tray of small crabs, the type which are brined then crushed and added to one variety of som tam – green papaya salad. Fresh scallops are another plentiful item. When buying them in the US, I’m used to seeing only the white adductor muscle and not the attached roe. Here they are sold still in the shell with all the bits still attached. 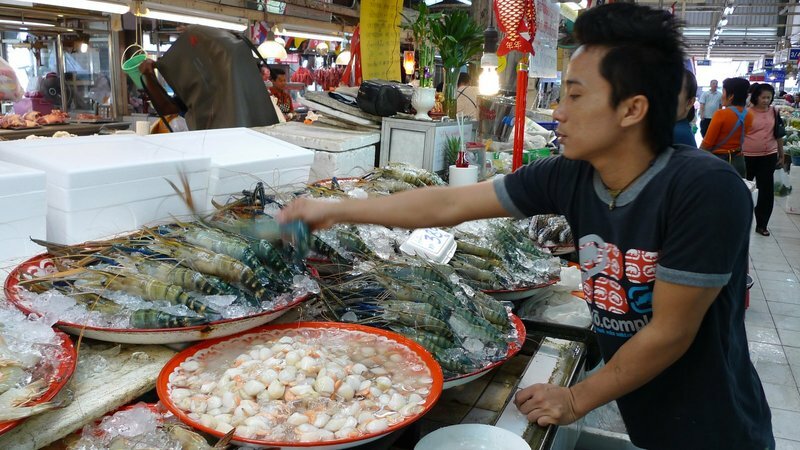 Another popular sea food item is the giant river prawn. These beasts usually have a body about nine inches in length (not including the antennae) and are perfect for grilling. Here, a vendor stacks prawns for display. 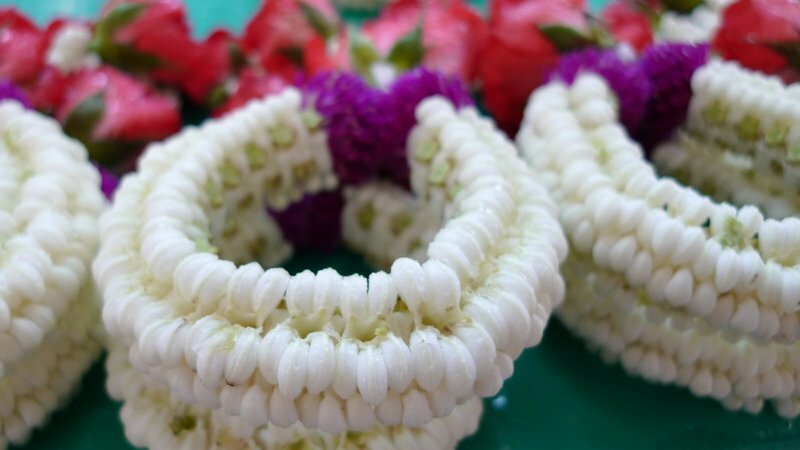 Or Tor Gor market also has several flower vendors, including some who specialize in garlands. 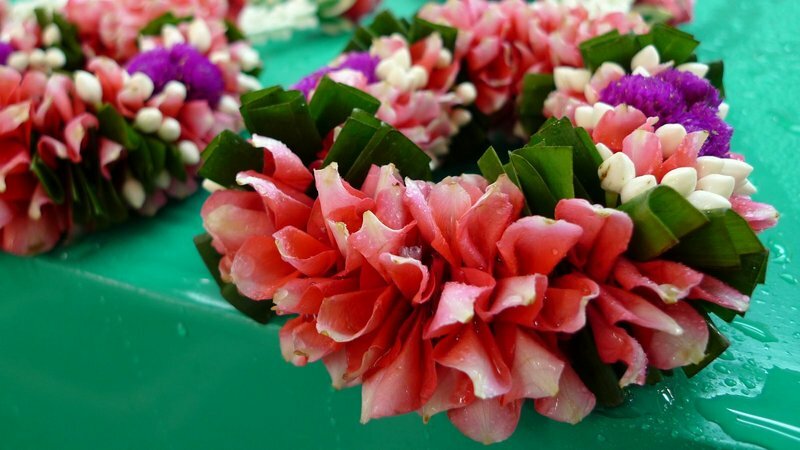 These hand-made flower arrangements are used for worship, placing them on Buddha statues and at shrines, as well as for honoring elders, guests, teachers, and other people of respect. This type of garland is especially fragrant. It will last for several days and each evening the room will smell of jasmine. Another prepared food vendor sells stir-fries and other dishes that are eaten with rice. Thus their Thai name, gap khao, which means “with rice”. In the steamer in the foreground of the picture is an interesting dish called hor mok. It is made with a mixture of flaked fish and red curry, steamed in a leaf cup until it has a mousse like texture, then topped with some coconut cream. Tawn made this for me on one of his first trips to San Francisco after we met, making do with the ingredients he could find at the time. For our breakfast (it was going on 11:00) we settled on four dishes with rice. 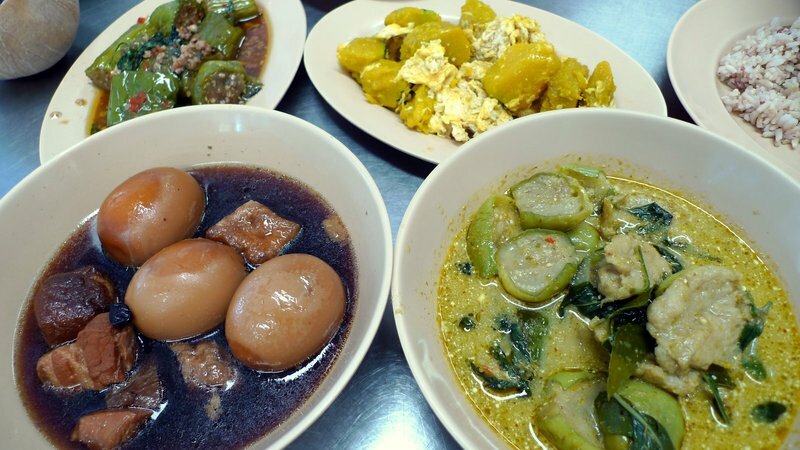 From the lower right, clockwise: green curry with fish cake, bitter eggplant and basil; pork belly and boiled eggs in soy sauce; eggplant fried in ground pork and basil; and pumpkin served with scrambled egg. Very tasty. Finally, after two days of trying we succeeded in getting a picture of the four of us together. This one was taken by a young lady who was sitting at the adjacent table waiting for her food to be delivered. Not only does it show you our handsome mugs but you can also get a good idea of what the market looks like with many of the prepared food vendors in the background. Again, it was a pleasure to have the opportunity to finally meet Jason and Daniel in person and a treat to be able to spend some time with them while they were in town. Hopefully, the next time we meet it will be in Tokyo! This entry was posted in Uncategorized and tagged Chatuchak, Daniel, food, Jason, Kamphaeng Phet, Market, Meat, Or Tor Gor, Produce, Seafood, xanga, Xangans by christao408. Bookmark the permalink. Happy New Year! Boy they look good. The seafood and the shrimp chips!!! Cool! I’ve ridden my bike there several times!This market is known for high quality of products, and thus commands a considerably higher price than other markets around Bangkok. It’s a favorite for housewives of well-to-do families, as you can see many Mercedes and BMW and Range Rovers parked around the market, bringing the ladies and their maids to shop. @Poomsira – No wonder we felt so out of place! =D Have a happy new year, Khun Poom. @yang1815 – Happy new year to you and Sugi! I would love to shop there if I had the money to purchase everything I wanted not what I needed. I hope you all had a good time. Happy New Year to you all. 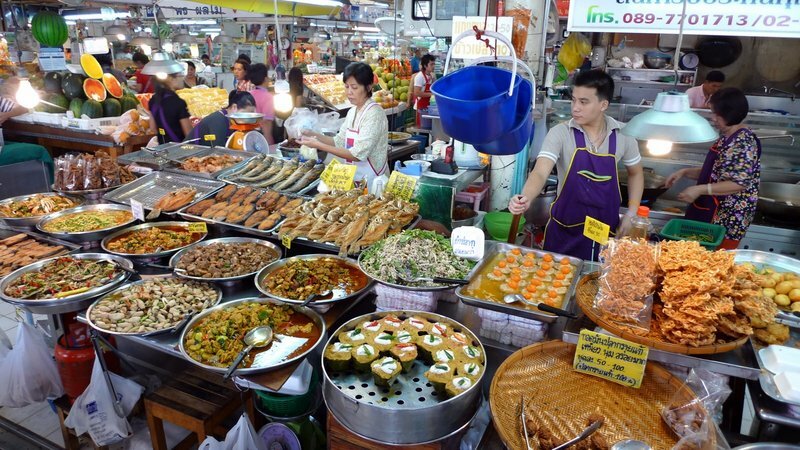 And now it is great to see current Bangkok life – all that luscious food. If we lived closer I’d ask you to send me one of those flower garlands to be my New Year’s gift to Joanie! Incredible market! Thanks for sharing! Even though you have posted pictures of them before, I just can’t grasp the true size of those shrimp! I, I can’t imagine. I have to stop thinking about shrimp that big….I think I’d like to just live at the market. My husband’s opinion on the “jungle” curry – why eat that when you can have the good stuff… He has become spoiled now that we have the Thai Noodle Alley. Couldn’t take my eyes off the first picture Chris! Beautiful pictures. I could give you the recipe for fresh curry paste if you like. That’s a nice and clean market, compared to the one I went to while taking a cooking class. Did you pick up some stuff to start the New Year? Happy New Year to you guys!! @AzureRecollections – Interesting question. Big picture, it isn’t something I worry about all that much. While there are concerns to be had, it seems that the seafood we find here is of generally good quality. @stepaside_loser – Well, you could go to Thailand and not take pictures of the food, but you wouldn’t be much of a Xangan then! =D@brooklyn2028 – Really? Hmmm… can’t say that I equate dried papaya with stinky feet. Interesting feet that they stink like papaya. =D@CurryPuffy – Yes, the kanaeng (baby cabbages) and crispy pork were picked up while we were here. @ZSA_MD – Doesn’t your cookbook have a recipe for fresh curry paste in it? If not, I’ll gladly take one. Thank you! @murisopsis – For people in North America, who are used to a much more modest “jumbo” shrimp, these river prawns are overwhelming. @RakkaRay – A flower garland would be an especially thoughtful gift for you to give your wife, Ray. Happy new year to you both! @ItsWhatEyeKnow – You are very welcome. Glad you enjoyed the visit. @Fatcat723 – Well, the good news is that the prices are tremendously reasonable so you probably could afford to buy all that you wanted! reading your blog sometimes gives me a better idea of this exact same city i’m also living in lol. so lost and confused sometimes, it’s amazing how i survive!so THAT’s what it was, the pumpkin and scrambled eggs. just had it for lunch and wondering about the contents. @stepaside_loser – No, there are two Jasons whose paths sometimes overlap. “Onmovement” and “Wangium”. Have met them and their partners and all four are nice people. @girl_smileyy – Isn’t it interesting how people can live in the same city but experience it in different ways? @christao408 – I bet you were as good a host to them, as well!